From an expert in adolescent psychology comes a groundbreaking, timely, and necessary guide for parents of the 2.2 million young adults in America who are struggling to find their way in the world. In Dr. Mark McConville's decades of experience as a family clinical psychologist, perhaps no problem has been more fraught than that of young adults who fail to successfully transition from adolescence into adulthood. These kids--technically adults--just can't get it together: they can't hold a job, they struggle to develop meaningful relationships, and they often end up back in their parents' spare bedroom or on the couch. In fact, studies show that 1 in 4 Americans aged 25-34 neither work nor attend school, and it's a problem that spans all socioeconomic and geographic boundaries. McConville investigates the root causes of this problem: Why are kids "failing to launch" in ever-increasing numbers? And what can parents do to help them get on their feet (and out the door) to start their own lives? The key, McConville has found, is that there are 3 key skills that are necessary to make the transition from childhood to adulthood: finding a sense of direction and purpose (What do I want to do? ), developing administrative responsibility (How will I go about doing it? ), and cultivating interdependence (How can I work with others to help me succeed?). He offers an accessible, practical guide for the whole family, to help parents instill those skills in their young adults--and get their kids off the couch and into the real world, ready to start their lives. 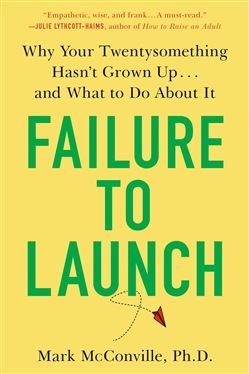 Acquista Failure to Launch in Epub: dopo aver letto l’ebook Failure to Launch di Ph.D. Mark McConville ti invitiamo a lasciarci una Recensione qui sotto: sarà utile agli utenti che non abbiano ancora letto questo libro e che vogliano avere delle opinioni altrui. L’opinione su di un libro è molto soggettiva e per questo leggere eventuali recensioni negative non ci dovrà frenare dall’acquisto, anzi dovrà spingerci ad acquistare il libro in fretta per poter dire la nostra ed eventualmente smentire quanto commentato da altri, contribuendo ad arricchire più possibile i commenti e dare sempre più spunti di confronto al pubblico online.